Stephane Da Costa, the Parisian who put up impressive numbers at this year's world hockey championship, has multiple NHL teams interested in signing him, according to TSN Hockey Insider Darren Dreger. 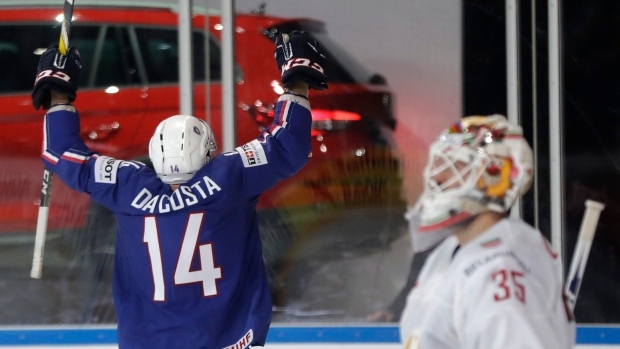 Dreger adds that Da Costa fully intends to play in the NHL next season after spending the past three seasons in the Kontinental Hockey League with CSKA Moscow. Multiple teams have called on Stephane Da Costa. He 100% intends on playing in the NHL next season. Was in KHL last 3 years. Da Costa netted six goals and four assists in just six games at the world championships in Paris last month. The 27-year-old scored nine goals and tallied 20 points in 24 regular season games this season in the KHL, adding four goals and eight points in 10 playoff games. Da Costa scored a career-high 30 goals and added 32 assists in 46 games with CSKA Moscow during the 2014-15 season. A former Ottawa Senator, Da Costa last played in the NHL during the 2013-14 season, scoring three goals and four points in 12 games. He owns seven goals and four assists in 47 career NHL games, all with the Senators.